Gerard De Rooy took 3rd place in the Truck Class of the 2019 Dakar Rally with all 4 of the Petronas Team De Rooy Ivecos finishing in the top 10 on standard Goodyear Offroad ORD tires. The team was the only one to see all its trucks finish. Dutchman Gerard De Rooy 2-times winner of the Dakar and winner of the Africa Eco Race 2018 finished 3rd, Argentinian Federico Villagra finished 4th, Ton van Genugten, also from the Netherlands, won the final stage and took 7th place with Maurik van den Heuvel, the other Dutch driver in the team, finishing 10th. Russians Eduard Nikolaev, who has won the event 3 times before, and Dmitry Sotnikov took 1st and 2nd places in the Truck Class. Two of their 4 Kamaz trucks finished. Team De Rooy Iveco Powerstar trucks raced on regular Goodyear 375/90R22.5 Offroad ORD tires. 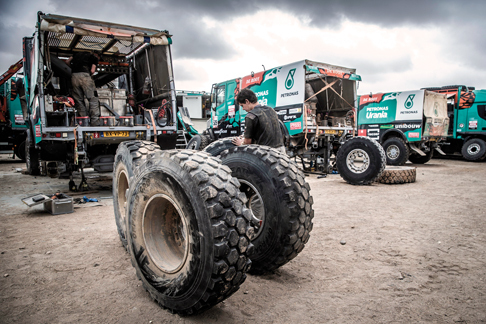 As well as racing on Goodyear tires, Petronas Team De Rooy Iveco ran Goodyear OMNITRAC mixed service tires on their service trucks, which followed the team on the rally. “We congratulate Gerard de Rooy and his team on their success, which was achieved with regular Goodyear Offroad ORD tires produced in our Luxembourg plant. The hard work they have put in, supported by our engineers in finding the optimum set up for the vehicles, has certainly paid off and our ORD tires have proved the outstanding performance they offer in the toughest conditions imaginable,” said Benjamin Willot, director marketing Commercial Tires Europe at Goodyear. The 2019 Dakar took place exclusively in Peru, covering 5,000 km of which about 70% was on sand, and included 10 special stages over 3,000 km. The rally started in Lima, Peru, on January 6th. More than 330 trucks, cars and motorcycles raced to Tacna on the border with Chile before returning to Lima for the finish on January 17th.